Well, it's done. 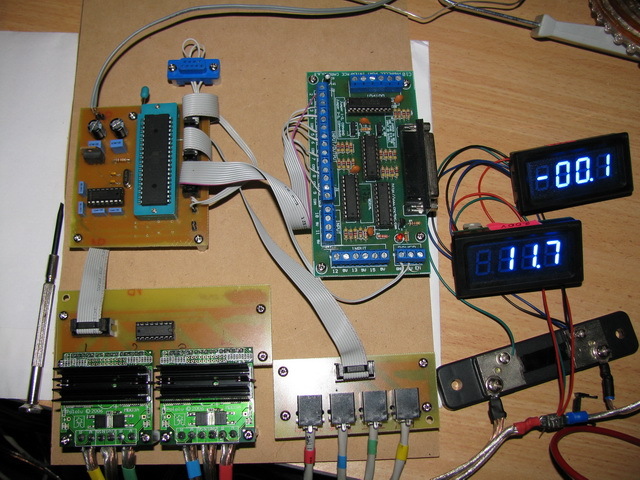 I now have a self "contained" version of my 4 channel servo controller. I've made PCBs for the controller, encoder & driver boards and mounted them all with the CNC4PC break out board I bought. Controller Board (Top Left) - This was my first DIY PCB, and the design is a bit rough (no nice mounting holes, board shape, etc). The firmware can be updated via serial, so I didn't add an In System Programming connector (uC is in a ZIF socket in case of fuckup). 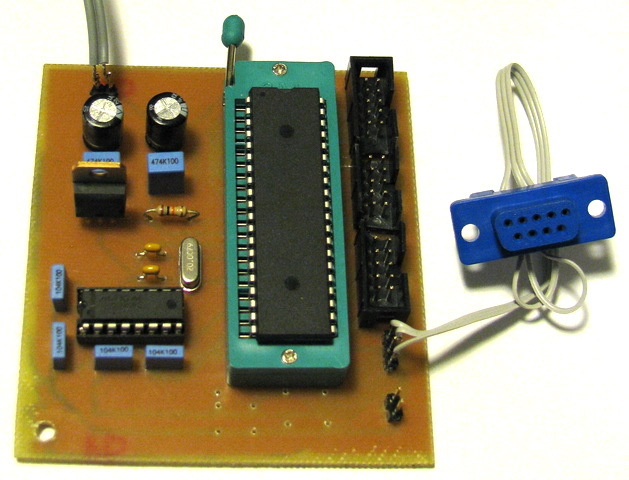 PC Break Out Board (Top Right) - This is a CNC4PC C10 Bidirectional Breakout Board. It's a basic BOB with buffered I/Os. 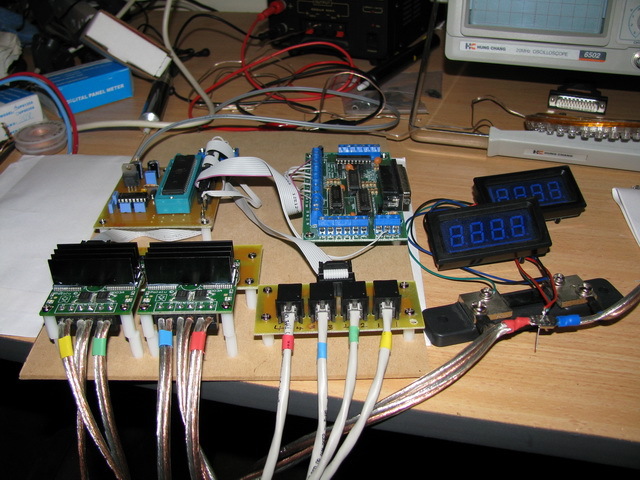 Gets data from the PC into the servo controller. Driver Board (Bottom Left) - It takes the 4 PWM+DIR signals from the controller and maps those into 2 dual H-bridge Pololu boards. I've added a couple of heat sinks to the H-bridge driver chips, which should help their cooling. Encoder Board (Bottom Right) - Simply takes neat 4P4C modular connectors into jacks. The final product is a neat little package... at least for my first attempt. Mount the meters nicely - The voltmeter & ammeter are just loosely connected at the moment. Load testing & tuning - Does its performance match my original goals? Are there areas in the firmware that need attention? Mounting motors on real milling machine - What's the real world like? For the first time, I would happily pick it up, move it, and feel confident about it working when reconnected (little coloured bits of heat-shrink reduce confusion). If you've seen my latest PCB creation attempt, you'll know I'm ready to try and assemble my servo controller. This is the ultimate test of my newly acquired PCB layout and fabrication skills. A good "looking" board will show its true colours when assembled... and I learned a few things. 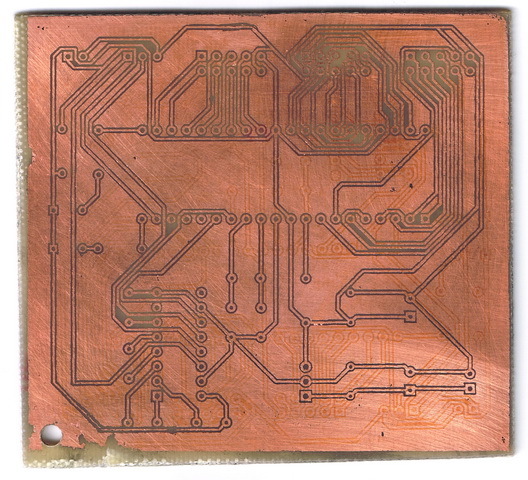 The fill (leaving most of the copper in place and only etching enough to isolate the required tracks) caused problems during soldering. There just wasn't enough clearance for my rough soldering skills. The minimal clearance gap used to allow tracks to weave between the 0.1" pitch pads was too small to deal with when soldering every pad. I dragged solder from pad to fill a number of times, and had to grab the wick. I don't mind taking the extra care when needed, but on every pad? I'll increase this gap in the future. The physical clearances around header sockets and the ZIF sockets were a little tight... I should check such things a little more thoroughly. A sharp knife made them fit. The resistor lengths weren't checked... the carbon films I used were longer than the default I'd selected. They fit with a little inward bending. Repairing tracks is best done with a strand of copper wire laid & soldered along the broken track. A more elaborate method I tried (cutting a new track in the fill) only made things worse. I fired it up, setting the current limiting on my adjustable supply very low to protect the circuit in case of a short. It didn't consume more than a few 10's of mA which was all good. I plugged the serial plug into my machine and powered it up. Boom! Fizz! Nah, just kidding. The boot-loader showed its startup message and then it all appeared fine. I couldn't properly test it, since my ad-hoc board has all the encoder inputs & driver outputs wired in (as can be seen here), and this new board doesn't. My plan includes making another board (or two) which takes the 10 pin header from the controller and breaks it out into the 4 channels with separate connectors. Given the relative ease with which I've made this one... I'll pump out the extra board in no time. I think its fair to say, that I'm a little pleased with myself. In my previous attempt, removing the paper after ironing was an issue. The Inkjet Photo paper I used had a thin, yet tough, film on the glossy side that stuck between tracks. Removing it was a slow process as any rough attempt would lift the toner track. Also, the paper would bubble and lift when dropped in the water... taking the toner with it. From the web, I knew the results depended largely on the paper, with everyone having their favourite paper. What you need is something smooth (glossy) to transfer a clear image, and easily removed with water. An idea I had seen was using pages from colour magazines or brochures. The paper is glossy and easily breaks down in water. I looked thru my bin for some junk mail and found a Kmart catalogue: smooth & glossy - yup, disintegrates in water - have you seen these after rain? 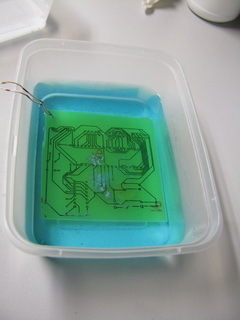 I also filled the unused area of my PCB. 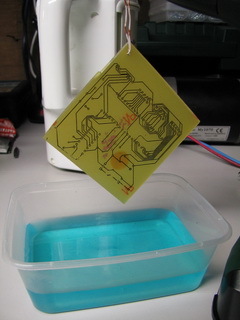 This will give extra toner to hold the paper down, and also gives the etchant less work to do. The shadow you can see was from my first attempt. This was using the inkjet paper, but chunks of toner pulled up when getting the last of the paper up. I removed it was acetone, but the outline remained. The dark spot at the top right is from lighting, and not really visible (except in this photo). The outcome was: two bridges & 1 broken track. The bridges were easily fixed with a knife, and the break was repair with some light wire. The bridges may have been from the toner transfer (I'll look closer next time), and the broken track I think is where I (once again) didn't apply enough pressure near an edge. Now I'm going to try drilling (not looking foward to that job) and soldering it together. 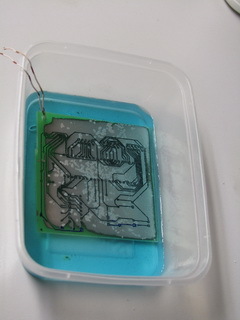 If I can iron out the bugs from this PCB creation method, it'll open new doors into custom circuit creation. 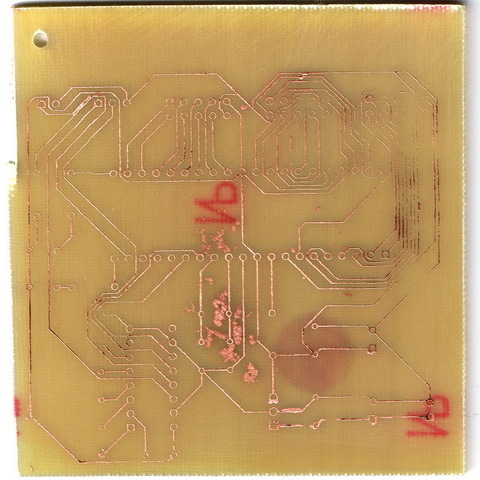 A little while ago I printed a PCB design on my laser printer to some ink-jet paper I had, and ironed that onto some blank PCB. After that, let it soak in water, and lightly brushed the paper away. 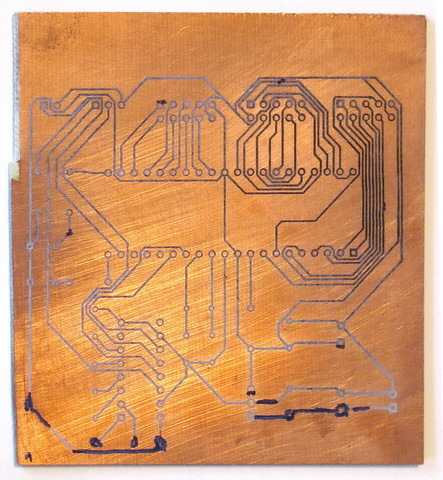 This is my first attempt at home brew PCB creation using the toner transfer method, and the results (while not perfect) are not bad for a first attempt. There's two parts to this process where I need some more practice: transfer & etching. I actually did the transfer twice. The first time, a number of the tracks didn't fuse and lifted. I used more pressure and a longer duration the second time, and the result was much better. One edge was a little patchy, and I'd say my lack of even ironing contributed to this. I though the layout was more centered (see the large gap at the top), and didn't put effort right up to those edges. I touched up a few of the patchy areas with a pen (which was a little large nibbed). Not wanting to make up a large batch of etchant, I grabbed a plastic container just large enough for the board and put in ammonium persulfate crystals. The instructions on my etchant container said 75°C, so I boiled the jug and took it downstairs. The etching started well, but pretty much came to a stop with a few blobs of copper still remaining. This is going to be due to one of two things: not strong enough etchant or not enough heat. So, I need to work out a more accurate way to measure out the ammonium persulfate crystals (some small scales), and a way to keep the etchant heated (maybe a hot plate or oven). 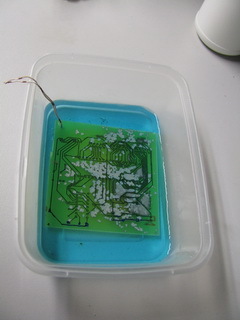 After giving the board a scrub to remove the toner this is the final result. Some of the tracks appear to have been etched from under the toner (they looked good until the toner was removed). This is probably because I left it in the etchant for nearly 30 minutes. It should have only taken about 10 minutes. There were a few areas where the toner transfer wasn't the best, and a more even ironing should help this. This board is beyond repair, as the tracks on the far left are all broken and they're too fine to repair. This is a learning process, so I'll do another one and see how it goes.